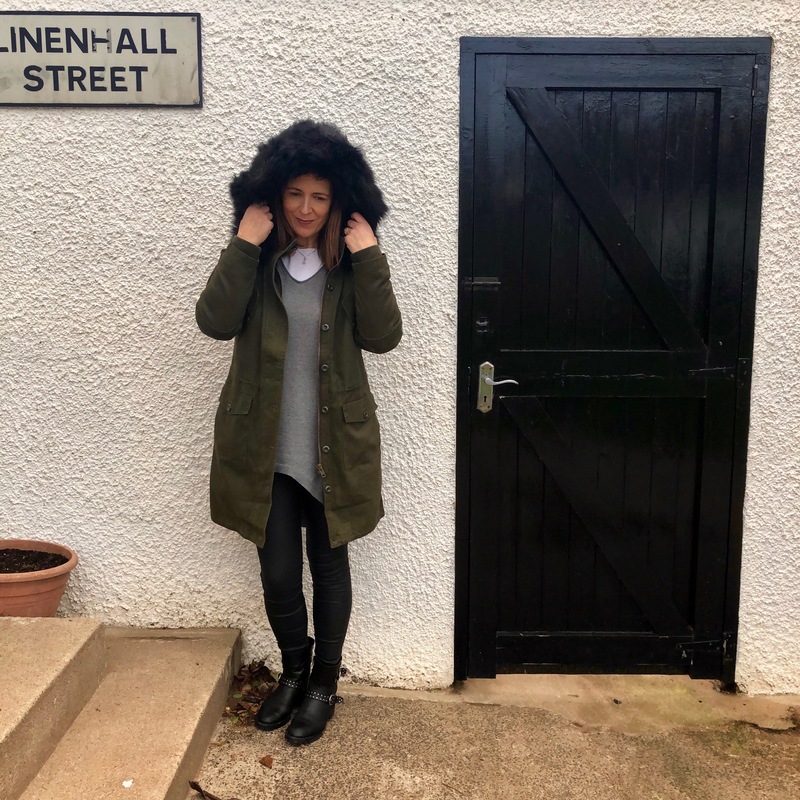 [AD - Affiliate Links] So as per my first sales post (on this link), I mentioned I bought the Britt Parka after it was reduced in the hush sale. This was after many times looking at and trying to justify it at full price...so I was excited when it was reduced. I think the issue is that I had to iron it when it arrived. I was expecting the cotton to be more sheeny - if that makes sense? But it's very much normal cotton and it was quite creased around the bottom and I don't know why, but I dislike having to iron something before I have decided I want to keep it. To help me make up my mind...top tip here...I took some photos of me wearing it in the garden. I sometimes ask the kids but mostly I use my trusty tripod which I got on eBay for about £5. Either way, it's worth getting some photos if you can't make up your mind about something. It's also got elastic cuffs to keep your wrists warm and the hood is fur lined as well as having the fur trim around it. The negatives are that it's still £125 in the sale and there's no sign of it going down further. The other negative is that I can't make up my mind about the fur trim. It's lovely when the hood is down but has the effect of a scary furry 'fro about it when you put it up. 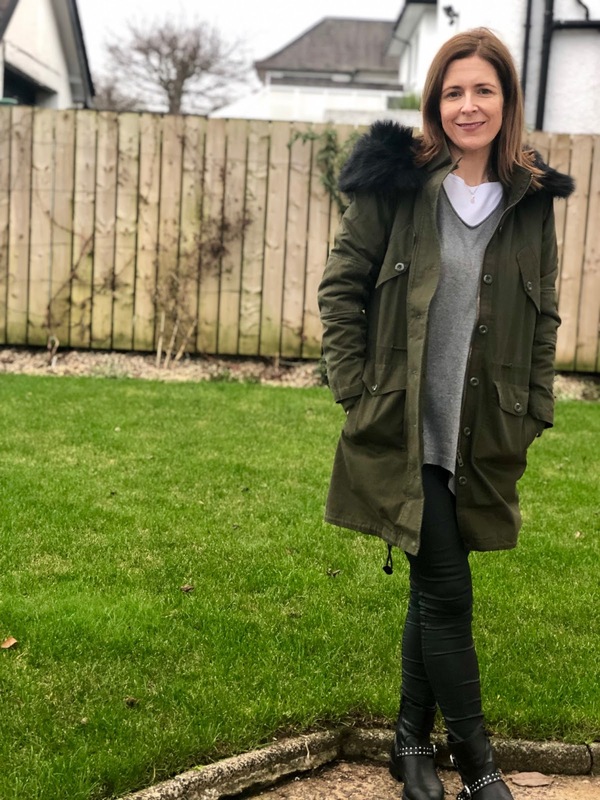 But perhaps I'll be glad of this on the cold hockey pitch sidelines and I'm not a massive user of hoods anyway, preferring to wear a wooly hat. Which brings me onto the last negative, it's not waterproof at all...so the hood would only be for warmth. 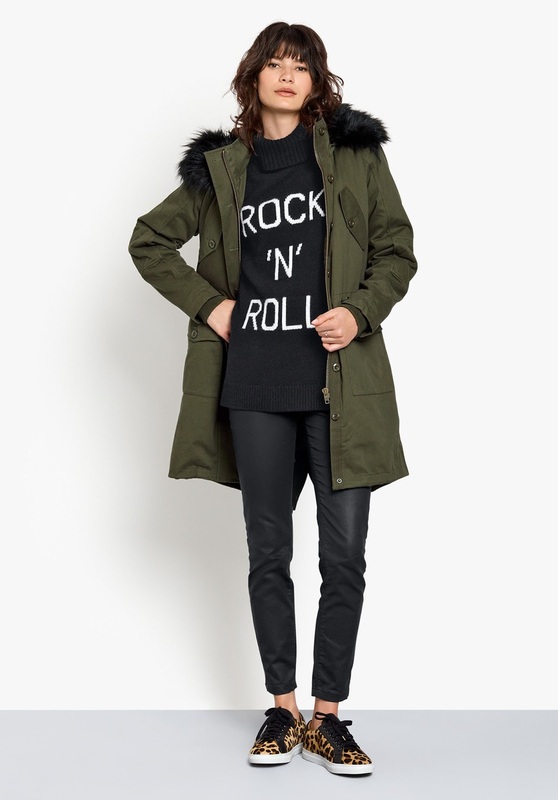 Of course, most classic parkas aren't waterproof anyway, I know that. But a bit of a sheen on the cotton would definitely make it a bit shower/drizzle proof. All told however, I think I love it. 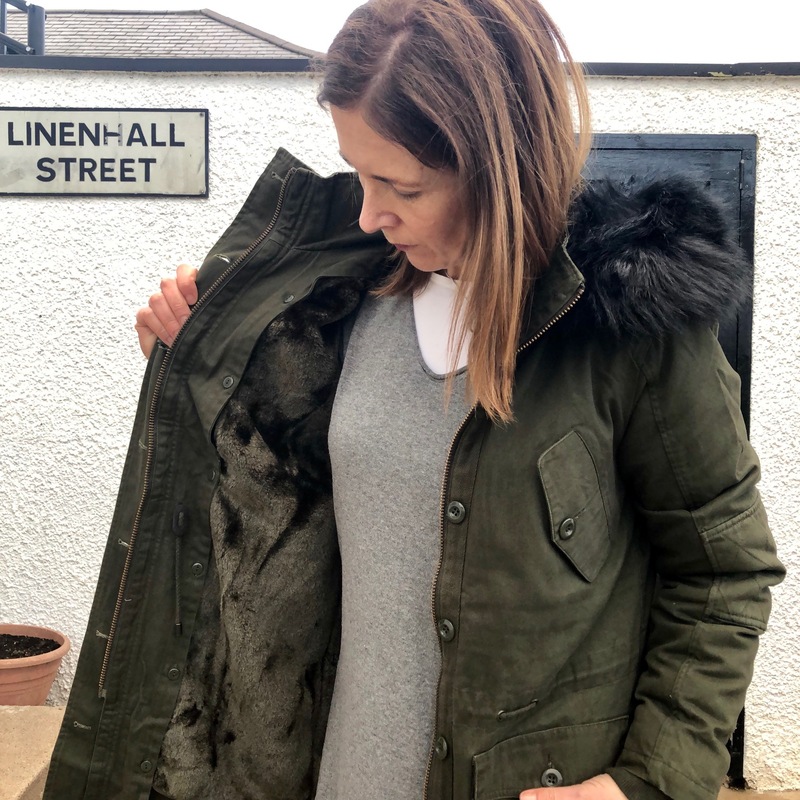 I met my friend Clodagh the other day wearing hers and it reminded me how effortlessly cool a parka is and the fulsome black fur I think elevates it from something a younger person would wear, into something much more stylish and classy.....I think? Having cleared out so many of my coats in the past year, including my Warehouse parka which had lost it's fur lining and wasn't much use without it, I've decided I'm going to keep this. The upcoming cold snap might have also had a part to play. and this black one - limited sizes left in both. Let me know what you think....mutton or super stylish?! 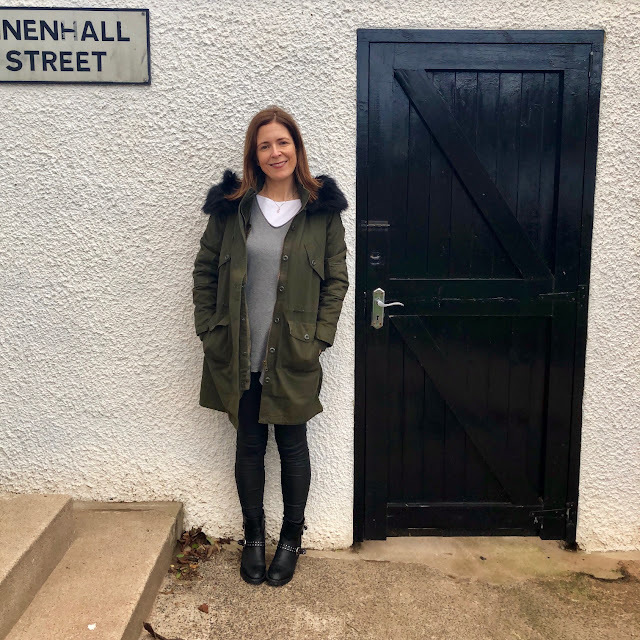 Maybe don't let me know if you think the former..
For info, this is not a sponsored post..I bought the parka myself. My links are affiliate links so hush knows you came to their site from this website. It looks great on you Avril! I've tried eleventybillion parkas this season and can't find one that looks right on me! Whistles was the last one which is lovely but swamped me - it's quite a hard style to find a flattering one! PS can't think about summer stuff - wish I had a holiday to look forward to! Ha! 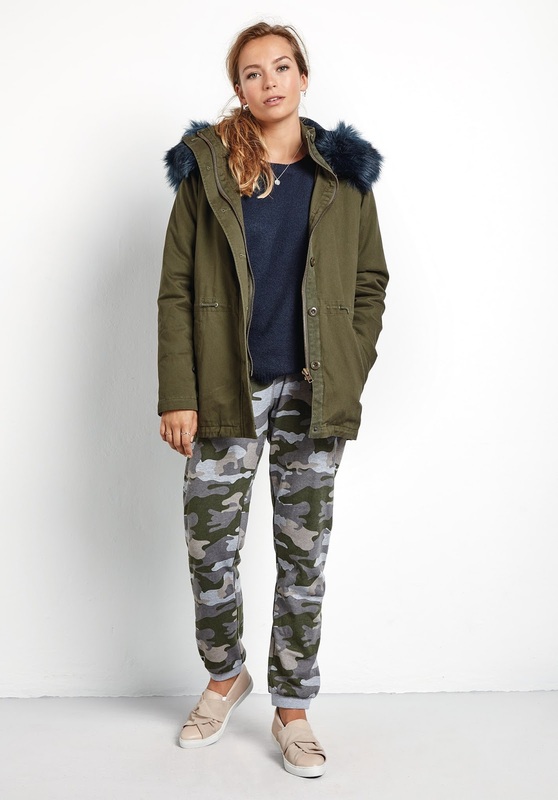 I'm having same dilemma with the Whistles Megan parka. 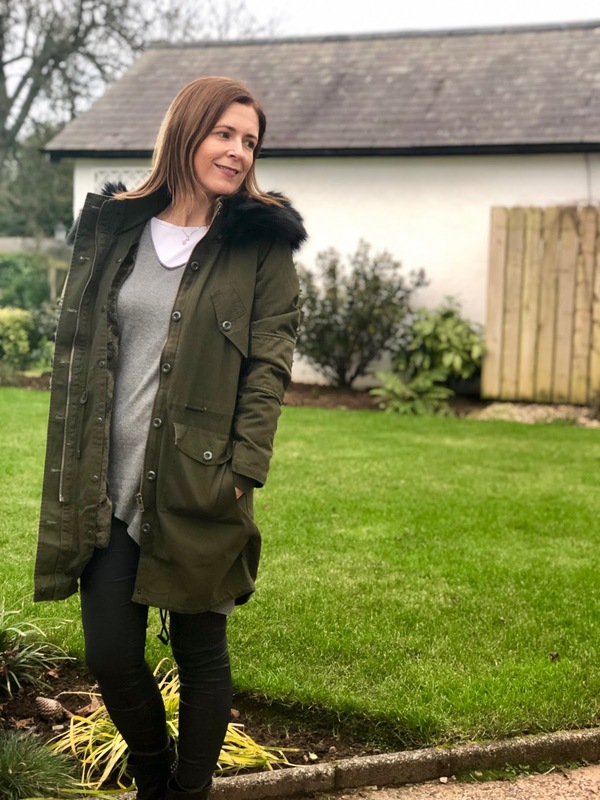 Never had a parka before in my life but fancied one for local walks (not in the rain-I dont walk in the rain!) I asked my 2 sons and they both said fresh Mum. I also felt like an Eskimo when I put the hood up. It's got usual colour fur hood but nice teddy style lined fabric. As I bagged it for £84 it's gone in my hall cupboard! They don't go out of fashion do they and as there is a fur hood they can't really be used in the rain is my thinking. Just started following you on here btw. I like a good blog read.